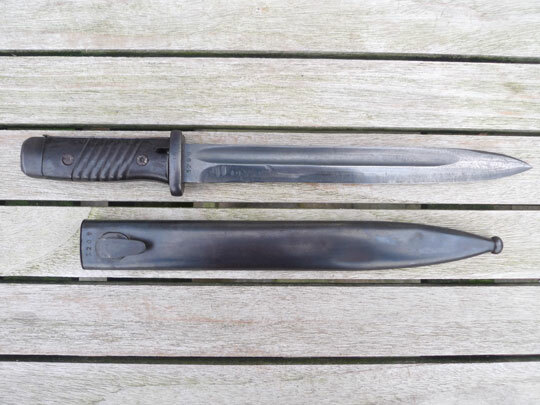 Fighting knife made from a German M 84/98 bayonet. Serial nummer: 3209 Matching Very good fullered shortened blade to 23,3 cm with maker's code 43. cul (= ERNST PACK & Söhne) on ricasso. Very good shortened blued pommel and crossguard. Excellent dark brown bakelite grips secured to the tang by two screw bolts. Very nice not shortened scabbard without dents marked 43.cul and matching serial number 3209 on reverse side. Total length 33,2 cm.